What is RFID and Why do I Need to Block It? Credits cards, government issued personal identification cards, passports, and more are being fitted with Radio Frequency Identification (RFID) chips. These chips act like the magnetic strip on your credit card or drivers license and are able to quickly and wirelessly transmit personal and financial data. These chips help you check out at the store faster, speed up your time at customs, and generally make your life easier. HOWEVER, and this is big, some malicious individuals have found ways to intercept these RFID signals and steal your personal and financial information. Our RFID blocking wallets help protect you by blocking the signals that thieves are trying to steal. - LF devices operate at 125 KHz or 134 KHz and have a read distance of up to 10 cm. This is what your access card uses to let you in the door at work. LF devices tend to work more slowly than HF but are more powerful than the other two, meaning they can work through metal or other materials (like our wallet) that block LF signals. - HF devices operate at 13.56 MHz and have a read distance of up to 1 meter. HF devices include credit cards and government issued ID cards. The lining in the Stealth Mode wallets blocks this frequency to prevent your personal and financial information from being stolen. Stealth Mode wallets are designed to block HF signals since that is the frequency used by credit cards and government issued ID cards. 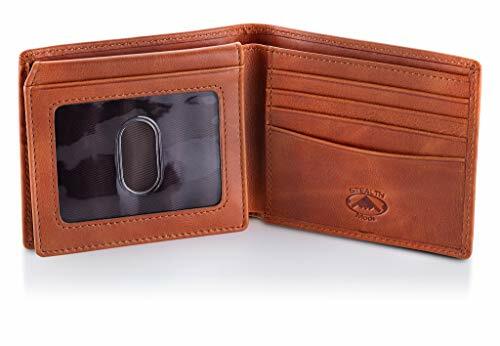 - Wallet Dimensions: 4.25" x 3.25" x .5"
This 2 id window wallet features quality napa leather, 8 credit card card slots and a flip out ID window that hold 2 cards, divided billfold, and our secure RFID blocking lining to keep your personal and financial info safe. Measuring 4.25" x 3.25 when closed this men's wallet has 8 card slots plus an ID flap and can comfortably fit 12+ cards. It also includes a divided billfold to keep your money and receipts organized. The RFID blocking lining helps keep your personal and financial info safe by blocking malicious attempts to steal your identity from your chip enable cards. Our lining blocks high frequency (13.56 MHz) RFID signals. Packaged in a handsome box, this stealth wallet makes a great gift for men. If you have any questions about this product by Stealth Mode, contact us by completing and submitting the form below. If you are looking for a specif part number, please include it with your message.